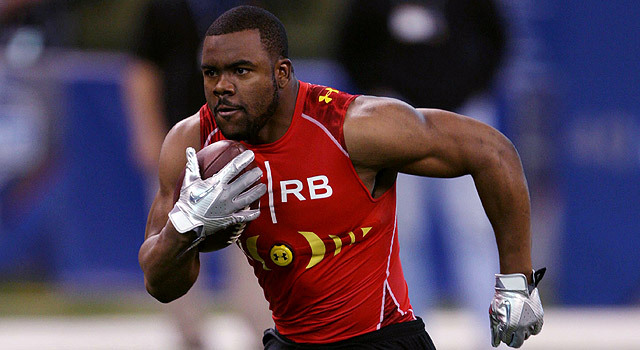 Published: March 6, 2011 at 05:30 p.m.
Mark Ingram entered the combine as the top back and did enough to leave Indy with that distinction. This year's running back class isn't regarded as the deepest or most talented, but the NFL Scouting Combine provided a big stage for several runners. Heading into the event, Mark Ingram appeared the only player capable of making an instant impact based on his college résumé. He won the Heisman Trophy as a sophomore and produced this season despite missing time with an injury. Although he lacks eye-popping speed and explosiveness, Ingram is a rough, rugged runner who will make a living between the tackles. He also has excellent body control, balance and quickness. His game evokes memories of Emmitt Smith. In a different mold, a dazzling display of speed, quickness and agility would certainly catch the eyes of evaluators desperately looking for backfield help. Oklahoma's DeMarco Murray and Connecticut's Jordan Todman showed impressive skills, instincts and awareness while running through drills. Their balance, body control and burst shined as they weaved through the cones and reacted to movement. Even though bag drills fail to accurately simulate the speed of game action, the skills displayed in those gauntlets often translates to the field. Murray and Todman also have exceptional speed and quickness. Both recorded forty times in the 4.4 range, making them a threat to take it the distance from anywhere on the field. With that kind of big-play potential, Murray and Todman are poised to experience a push up draft boards. If they can turn in impressive showings at their respective pro days, both could hear their name called sooner than some expect. Here's a look at the backs that impressed with what they did at the combine. He didn't post impressive numbers (4.62 in the 40-yard dash, 31 ½-inch vertical and 7.13 three-cone drill) for an elite runner, but he still stood out as the top back in attendance. He showed excellent balance and body control running through drills. His quickness with the ball in his hands suggests that he is a better football player than tester. Throw in his display of hands in receiving drills, and Ingram still ranks as the option at the position. Whether that is enough to make him a top-15 pick will be determined by his workout in front of scouts at his pro day. The running back class lacks a wealth of explosive options, but Leshoure showed something in Indy. His numbers in the vertical jump (38"), broad jump (10'2"), short shuttle (4.40) and three-cone drill (6.82) suggest he can be an elite runner. Building on that, he illustrated good agility and lateral movement skills with the ball in his hands. Although his 4.59 40 time will lead many to point out a perceived lack of homerun speed, his game film implies he's fast enough to have success. He will get another chance to prove his speed at his pro day, but he showed enough promise in Indy to cement his status as one of the top backs. With the combine over, there are only two running backs among Gil Brandt's Hot 100 players. Find out who made the cut and who has work to do before the draft. He needed a strong performance to make up for his disappointing season and responded with a solid effort. While his 4.61 40 time is troublesome, he has put enough long runs on tape to silence some of the questions about his speed. His nimble feet and balance were evident in drills. He also shows a natural feel for making cuts in traffic. Even though a workout in shorts can only reveal so much, Williams helped himself remain relevant. Speed is always noteworthy at the combine, and Murray's explosiveness caught the attention of all evaluators in attendance. He posted an impressive 4.41 time in the 40, a 34 ½-inch vertical and 10'4" broad jump. While he's a bit of a straight-line runner (also reflected by his 7.28 three-cone drill), Murray showed an ability to catch passes out of the backfield. With few speed demons in this draft class, Murray's combination of speed and versatility makes him a coveted prospect. After quietly entering the draft with little fanfare, Todman started to create buzz following his exceptional workout in Indy. His 40 (4.40), short shuttle (4.18), vertical (38") and broad jump (10'6") were solid. He shined running through drills and his production on tape is just as impressive. His footwork, quickness and body control translates to the field. While few have uttered Todman's name as a potential impact player, his underappreciated game should boost his stock.